Welcome! Here you'll find promotions, my artwork, inspiration, and humor. If this newsletter was forwarded to you, please subscribe here. I just learned about the NU Hotel located in the heart of downtown Brooklyn; it’s a vacationing art lover’s dream. Creative murals by international artists adorn select walls of this inn. 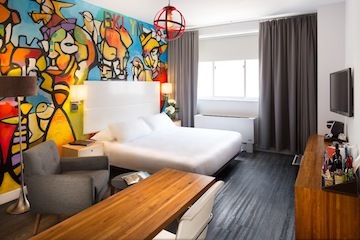 The well-appointed rooms feature bold nature, urban, pattern and street art from an eclectic mix of painters. Beauty and style merge at this progressive hotel, which is close to some hip neighborhoods. See more here. My latest art discovery is a gem. It’s The Studio Space on Madison in Dumont, New Jersey, which was formerly a church but actually looks like an unassuming storefront. It has a deceptively large 4,000 sq. ft. space. The most recent exhibition featured four diverse and interesting abstract artists, as well as music from one of my favorite jazz guitarists, Mark Sganga. It was a wonderful art show, and I highly recommend checking out the next exhibition. The space is also available to rent for private parties, corporate meetings, classes, concerts or events. I sometimes get attached to my paintings, especially the ones with the animals, who are like characters. But I’m grateful for all my sales and happy to see paintings go to new homes. It seems many of those homes are in the Seattle area, with my latest show there, “Good Karma,” selling 8 of 14 paintings. Well, technically, six are staying in the area, because one buyer is sending the two she purchased home to Greece. The new b9 office has the ambiance of a gallery, a credit to its designer, Bradley Khouri, who founded b9 architects in 2001 and has won several awards for urban infill and “green” architecture. (Brad is my nephew.) At my show there last year, I sold four paintings and received a commission for a large painting that I thoroughly enjoyed creating – and that my client loved. 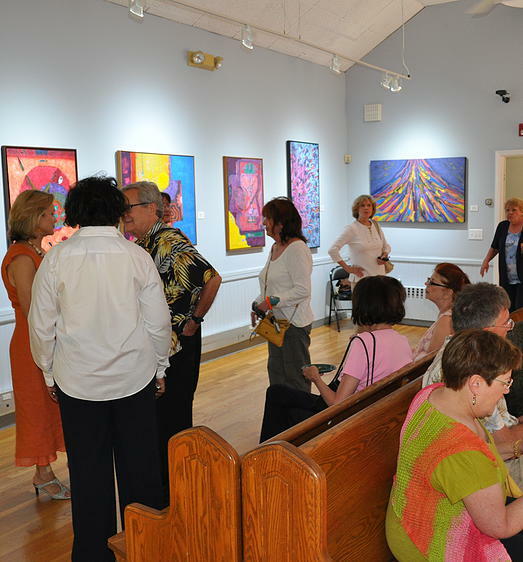 “Good Karma” officially ended Nov. 7, and buyers are picking up their paintings. Knowing that my art connected with people on an emotional or spiritual level is as satisfying as selling the work. Thank you, b9 and Seattle! Christineauda.com - contact me for prints, paintings or commissions. Thank you for your support. Contact me with questions or comments. If you enjoyed my newsletter, please share it. Copyright © 2014 Christine Auda, All rights reserved.